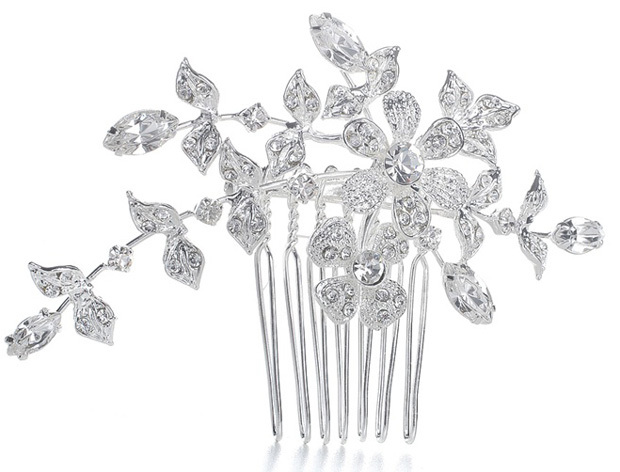 * This sparkling wedding comb by Mariell features a whimsical silver garden of Swarovski crystal flowers. * This wholesale crystal bridal hair accessory with vintage textured leaves and graceful vines can be worn as either a comb or a brooch thanks to a clever pin and detachable comb. * Our beautiful and versatile hair accessory measures 3 1/4" w x 2 1/4" h.